Most Western people, when they think about a tea ceremony, immediately envision British sitting at their tables mid-afternoon enjoying a cup of tea and some crumpets. Teatime is something that many people identify as belonging to the British Isles. However, that ceremony pales in comparison to the ancient and significant tea ceremony that exists in Japan. The roots of tea and tea ceremony are in the East and thus often times ignored. The Japanese tea ceremony is filled with meaning and significance, both spiritually and historically. The tea ceremony - chanoyu - is embedded deep in the Japanese culture and every aspect of this ceremony is meaningful. It is such an important part of culture that it needs to be examined and explored. This paper will explore the chanoyu which translates to “hot water for tea” in English (Tanaka 15). This report provides a historical background of the ceremony, the tea, the process and utensils used, and the historical significance of this well developed ceremony. The importance of the ceremony is enhanced by its history. Tea did not originate in Japan but rather was originally grown in China. The transmission of tea to China occurred through basic trade relations, but it was Monk Eisai who brought the idea of powdered tea to Japan from China. While others had simply submerged tea leaves in hot water to create tea, Monk Eisai taught them how to make powdered tea by grinding the leaves finely and mixing the powder with hot water (Tanaka 28). Additionally, Monk Eisai is reported to be the first person to grow tea for reasons beyond medicinal purposes as he grew it for religious reasons. His position as a Buddhist monk is part of the reason that the tea ceremony is associated with Zen Buddhism. Zen Buddhism is reflected throughout the tea ceremony as it helps induce meditation which is required to truly experience the tea ceremony.. Monk Eisai was a Zen Buddhist monk and his role in the transportation of tea to Japan has eternally linked Zen and tea. Tea was a mainstay in the conclusion of Buddhist religious ceremonies and it was within Zen monasteries that rules and guidelines for the handling of tea began to develop and emerge (Kamachi 90). More specifically, the monks would drink tea out of one bowl in front of the image of Bodhi Dharma as a holy sacrament and this ritual would eventually develop into the tea ceremony that is being investigated (Okakura 51). These rituals that began with the Zen monks would be further developed and perfected and a man named Sen no Rikyu played an integral role in this. Sen no Rikyu was a 16th century Japanese man who was a prominent figure in defining acceptable tea ceremony behaviors and aesthetic expectations for the chanoyu. Son of a merchant, Rikyu proved himself one of the most popular tea practitioners ever and served as tea master for Japanese political unifiers Oda Nobunaga and Toyotomi Hideyoshi. He stressed the loneliness (wabi) and the restrained beauty (sabi) of the tea ceremony as important aspects of such a ceremony in terms of the decorations and interior of the tearoom (Kamachi 90). Rikyu set the basics for the tea ceremony as it is known in Japan today. He also invented the nijiriguchi which is the small entrance to the tea room for guests who, in order to enter the room, often times must constrict their bodies. Rikyu stressed simplicity in this arena and taught the tea principles as Harmony, Reverence, Purity, and Calm (Sadler 102). As the exploration of this topic continues, one will be able to identify these principles in various aspects of the ceremony. Rikyu’s political significance will be discussed in terms of historical significance shortly, but at this point it should be expressed that Rikyu’s contributions to the tea ceremony were extremely valuable. He gave the ritual the guidelines it needed to truly be a ritual that one could follow. He gave it structure, which is what it needed coming out of the Buddhist monasteries. Now that one understands the background behind the tea ceremony, it is appropriate to begin discussing the ceremony, beginning with the tea itself. The tea itself - mattcha - is the most fundamental aspect of the ceremony and similar to all other aspects of this ceremony, it has meaning and is very important to the outcome of the ceremony. The mattcha is, as mentioned earlier, finely ground powder that is green in color and bitter in taste. By following Eisai's standard set of guidelines, one makes the tea by scooping the tea powder into the tea bowl and ladling enough hot water into the bowl to fill one quarter the capacity. The water and tea are then combined with the brisk mixing of the bamboo whisk, creating a desired foamy top (Kamachi 88). This very defined process represents Rikyu’s principles: the harmony of the tea and water creates the final product, the reverence one has for the utensils allows one to use them well, the purity of the tea is contained by the tea bowl, and the calmness of the situation is present in the tea maker's steady hand and tea preparation. While the tea is seen in this light as nourishment for the soul as well as a stimulant for the body, the mattcha was originally used for the medicinal qualities many believed it contained. The Japanese, as a result of the influential book by Monk Eisai entitled Tea Drinking for Health (Kissa yojoki), believed there to be medicinal properties found within the tea. Eisai describes the situation as man being most noble and therefore it is proper and prudent to preserve one’s life. He believes that good health lies in the health of the five organs: the heart, the liver, the lungs, the spleen, and the kidney. Of these organs, the heart is most superior and it is built up so by consuming tea. Tea prevents the weakness of the heart, which would cause all other organs to become weak as well. He creates tables to define the “Harmonious Functioning of the Five Organs.” Each organ has its own taste, with liver preferring acidic foods, lungs preferring pungent foods, the spleen being partial to sweet foods as the kidney is to salty foods, and finally the heart prefers bitter foods. This, naturally, includes tea. Eisai notes that people consume the acidic, pungent, sweet, and salty foods with no problem and in large amounts while there are small amounts of tea consumed (de Bary 238). It follows that this imbalance would cause sickness, proving to the Japanese the necessity of drinking tea in order to keep the heart (and thus the four other organs) well and strong. Eisai advises to “drink lots of tea, and one’s energy and spirits will be restored to full strength”(de Bary 240). This writing by Eisai portrays to the people the importance of tea, in their physical health, emotional health, as well as spiritual health. Many people had faith in this simple liquid because of the various aspects of it and this partly explains why this liquid in particular is the basis of a time-honored ceremony. There are many aspects to the actual ceremony of tea presentation and consumption including the utensils used and the expectations of the guests as well as the host. Several of the most important utensils that are used are the bamboo whisk, the tea caddy, the kettle, and the pottery bowl. Each utensil is a piece of art that varies in quality. The guests are expected to admire each piece as it has been carefully selected by the host for the specific tea ceremony. Distinct from the western standards for symmetry and similarity, the Japanese prefer to have unmatching cups and bowls. Along with that, no two utensils are exactly the same. This goes to the extent that the host will not put out two articles made in the same region or of the same substance. Favorite scoops or bowls are given poetic names - mei - by the owners for the special role they play in the ceremony (Tanaka 89). 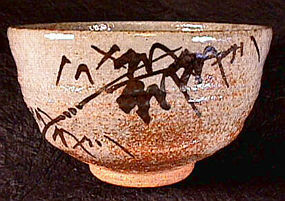 The tea bowl itself has specific features on it for the purpose of being used in the tea ceremony. Sen no Rikyu designed original bowls for serving tea, now called raku bowls, and they were made up of the rim, the foot, the base of the foot, the tea-pool at the bottom of the bowl, the whisking zone, and the wiping zone. These bowls were simple, as one would expect from Rikyu, and were red and black glazed earthenware that contrasted with the green tea (Tanaka 45). Like the complex yet simple raku bowls, the teakettle is basic and simple, yet iron pieces are arranged in the bottom to create a naturalistic melody as water boils. This reflects the harmony and purity of this aspect of the tea ceremony as taught by Rikyu. The various types and significant meanings for all the utensils are numerous - these are just several examples. Beyond the importance of the utensils, however, lies that of the expectations of the guest and the host, the actors in this choreographed ritual. One can understand that in any ceremony the host has a very strict set of guidelines to follow so as to invoke all that is sacred and meaningful in the tea ceremony. The process for making the tea and serving it within proper expectations is called temae. The host must remember to keep in mind Rikyu’s principles of tea - harmony, reverence, purity, and calm. Also, arrangement is very important in this aspect of the tea ceremony - setting the utensils down properly is important for they all must be placed so that one can admire their beauty from numerous angles is one example of this. Also, these utensils must be brought in individually to heighten the amount of surprise for the guests. After arranging the utensils, the host must then wipe them clean. Cleaning the tea container and tea scoop signifies a spiritual cleansing of the heart and mind. It is important for the host during this time of the chanoyu to expel any thoughts of the outside world from his or her head. After this, the host moves on to warming the tea whisk and tea bowl by pouring hot water into the bowl and placing the whisk in it. The whisk is examined to verify it is in good condition and the utensils are wiped dry. The host then proceeds to the actual making of the tea, described earlier. The ritual thus far has been done in complete silence so that the guest and the host can meditate and reflect. After the consumption of the tea is complete, the host is handed the bowls and rinses them with hot water, then wipes the tea scoop when all have had their share of tea. The host then returns all the utensils to their original locations after responding to the guests inquiries regarding them (Tanaka 134-137). One can see how harmony is invoked throughout this ceremony - the harmony exists between the host’s movements with the utensils and the preparation of the tea. Additionally, purity is an integral part as each utensil is purified with water or with a silk cloth before being used or returned to its position. Calm is also important for the host must remain calm and steady and refrain from moving too quickly and risk rushing his or her guests while at the same time must also refrain from moving too slowly which might not hold the interest of the guests. There are many guidelines the host must follow, as is easy to understand for the host runs the ceremony. Additionally, there are guidelines and expectations for the guest to follow as well and these are just as significant a part of the tea ceremony. The guests of the tea ceremony have an equally important role to making the tea with their role as the consumer of the tea. Before visiting a close friend, a guest must call first and arrange a time to stop by. Upon arrival, the guest removes his or her shoes and leaves them on the stones outside the nijiriguchi before entering the house per Japanese custom. The guest should not wear an overcoat or carry a handbag to avoid disrespecting the host and the tearoom - the items are to be left in a smaller room (Tanaka 93). The guest then enters the tearoom and is seated in complete silence. After taking in the incense, the decorative interior, and the sounds of nature, the guest is ready to enjoy the tea (de Bary 259). In the past, it was customary to wear a kimono for the chanoyu, although Japanese today typically wear western clothes, and this custom now carries over to the tea ceremony. Moreover, guests typically are expected to refrain from wearing perfume, which would spoil the environment in the room, and to remove jewelry to prevent knocking over tea utensils. It is expected that the guest will bring a folding fan to greet the host, a cotton hand towel - a handkerchief - to wipe one’s hands after rinsing them, and a square of cloth to rest the tea bowl when tea drinking has ceased. There is an extremely structured way to drink the tea, and it differs between thin tea and thick tea. Thin tea is consumed by first a single sip and then the rest all at once while thick tea is consumed in three and a half sips. In each process, the guest pauses between the first and second sips to comment on the quality of the tea (Tanaka 143-144). There is a very detailed way to hold and turn the tea bowl at various points during the drinking of the different kinds of tea. Each process does include small amounts of scripted conversation, but the ceremony otherwise remains silent. The guest, after finishing the tea, is then obliged to admire and inspect the tea bowl, the tea utensils, and the interior of the room including the hanging scroll and flower arrangements. The guest, unless very experienced, should not touch the utensils so as to avoid breaking them or spilling the contents. At this point it is polite to converse moderately, but one should not laugh or talk excessively (Tanaka 140). Like the host, the guest experiences Rikyu’s principles of tea. There is harmony in the actual process of drinking tea, and there is reverence in the silence maintained by the guest. The planned interactions between the guest and the host are a ceremony in themselves and they comprise what makes up the ceremonial aspect of the tea ceremony. Sen no Rikyu, one of the founding fathers of the tea ceremony, helped develop chanoyu into something that was politically significant. Rikyu was the tea master for two of the unifiers of Japan - Oda Nobunaga and Toyotomi Hideyoshi. Nobunaga used the tea ceremony to impress wealthy merchants who controlled the importation of Portuguese weapons. He gave the generals gifts of the articles used in the tea ceremony and won them over this way (Tanaka 42). Hideyoshi used the tea ceremony as a political tool more than Nobunaga did - he entertained allies with the tea ceremony frequently and even attempted to have a Great Tea Party. His love for the chanoyu is well known and he used it for negotiating purposes as well as diplomatic ones. In this sense, the tea ceremony influenced political situations in Japan - to what extent may never be known. In addition, the tea ceremony has had an influence on the unification of the Japanese people for it does not distinguish between classes. All classes participate in the chanoyu and all Japanese families possess every necessary utensil and object required to perform the tea ceremony. This is due to the Zen saying, “’Religion is a most ordinary thing.’” The level of artistic quality may vary but all believe in the clay that composes them for the transformation of the clay into a teacup is to Zen believers another spiritual aspect of the tea ceremony (de Bary 260). Additionally, the role of the woman in Japan was slightly elevated as a result of the tea ceremony. Women were encouraged to participate in the tea ceremonies in the nineteenth century and today there are more women tea masters than men (Kamachi 91). The tea ceremony was not affected by gender or class and proven that it has transcended anything else in the culture. Moreover, the tea ceremony has historically shown that it is another manner in which to express art, culture, and Buddhism. "Tea is nought but this. de Bary, William Theodore. Sources of the Japanese Tradition. New York: ColumbiaUniversity Press, 1958. Kamachi, Noriko. Culture and Customs of Japan. Westport, CT and London: Greenwood Press, 1999. Okakura, Kakuzo. The Book of Tea. Tokyo and New York: Kodansha International, 1989. Sadler, A.L. Cha-no-yu: The Japanese Tea Ceremony. Rutland, VT and Tokyo, Japan: Charles E. Tuttle Company, Inc., 1962. Tanaka, Sen’o and Tanaka, Sendo. The Tea Ceremony. Tokyo: Kodansha International, 1973. Varley, Paul and Kumakura Isao. Tea in Japan: Essays on the History of Chanoyu. Honolulu: University of Hawaii Press, 1989. Thorough site on the Tea Ceremony that includes a step by step etiquette guide for the ceremony for both guests and hosts. An online magazine that reports on many aspects of the Chanoyu. An overview of the chanoyu, with interesting pictures of tearooms and utensils. Describes the healthful benefits of green tea. A general informative site on the tea ceremony with a helpful glossary of terms.